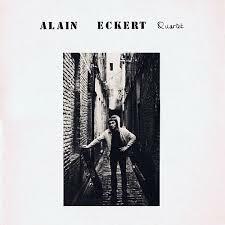 Alain Eckert was the guitarist of Art Zoyd between1976-81, participating in some of the band’s masterworks like “Symphonie pour le jour” and “Generation sans futur”. The quartet is Alain Lecointre (Navadati) on bass, Patricia Dallio (Art Zoyd) on keyboards and Serge Bringolf (Strave) on drums. They play a jazz progressive mix with many classical, post-classical and improv influences. Compositions are built on complexity, inventiveness, imagination and the superb abilities of the musicians for precise, difficult, adventurous playing. Despite the absence of horns, violins, cellos etc… there is a superior acoustic sense prevailing due to the pure excellence of inspired piano & guitar. Udi Koomran. The reissue has 30 minutes of bonus, recorded live at the “A l’Ouest de la Grosne” club by Jacky Barbier, the same year.